But the urban mobile model that is often described is not a universal truth, far from it. A few months ago the Google policy team contacted Diffraction Analysis and asked us to analyze alternative connectivity models were and how they worked. 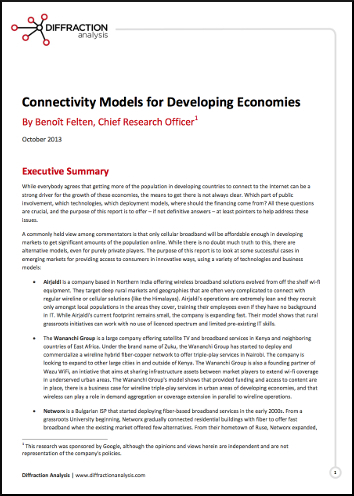 The result is this white paper entitled Connectivity Models for Developing Economies. In this paper we examine a number of cases that do not conform to the “standard” model being displayed for developing economies. We also examine policy approaches that seem to have made a measurable difference. This paper does not offer a silver bullet solution for all developing economies: there’s no such thing. It does however analyse interesting case studies and looks at the replicable aspects of some of these models. You can find the paper on SSRN through the following link: Connectivity Models for Developing Economies.